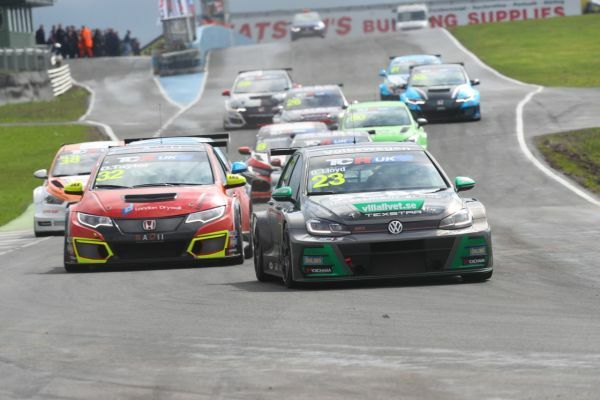 Huddersfield’s Daniel Lloyd retained his 100% performance record at the weekend taking pole position and both race wins during rounds 3 and 4 of the 2018 TCR UK Championship at Knockhill Racing Circuit (May 12/13). Lloyd delivered another flawless finish in the WestCoast Racing VW Golf GTI for the second consecutive meeting in the inaugural TCR UK season, securing maximum points on the reverse circuit configuration to extend his Championship lead to an incredible 66 point advantage – with four wins from four races. Topping the timing sheets during both free practice sessions on the Fife track, Lloyd took his second pole of the season after just eight minutes of qualifying. With times tumbling as the session heated up, the Yorkshireman held off challenges from local racer Aiden Moffat to lock-down the top spot with a time of 50.823 seconds, two and a half tenths clear of the Scot. “It was mega – I was over the moon with the actual lap itself;” commented Lloyd. “Aiden put quite a bit of pressure on me and he was getting really close. He was around two hundredths behind me, so I needed to pull something out of the bag, so I just pushed 100% and nailed every corner. I literally could not have gone quicker than that, so I was really happy. A textbook lights to flag victory followed in race 1, with the 26-year-old never looking troubled by the chasing pack. Controlling the race from the start-finish line, Lloyd built up an early lead to eventually cross the line 2 seconds clear of his nearest rival to take his third win of the season. “There were quite a few complications at the start of the race with the grid positions changing around which was really unsettling, but I just needed to do the job and made sure that I got the win. Starting from 9th for race 2 by virtue of the reversed grid, Lloyd quickly made light work of the pack, expertly picking his way up into 6th as the grid completed its first tour of the circuit, before slipping into 2nd by lap eight. Firing past BTCC racer Josh Price on lap 11, Lloyd stole into the race lead and had opened up a lead of over 2 seconds before the safety car was called into play on lap 23. With the gap narrowed and only 1 racing lap left to run, he held position to the flag, piloting the #23 Golf home with a 1.459 lead for his fourth race win of 2018. “I planned to take race 2 quite safe, but you’ve got to capitalise on opportunities when they appear and that’s what I did. I had a good start and then just settled down and got going, so it was an awesome result. “I got past Price and my pace was great, but to be honest the tyres started dropping off quite a bit, so I was a bit gutted to see the safety car again. I had in my mind what I was going to do at the restart and really took off again. The weekend’s results see Lloyd extend his advantage at the top of the TCR UK standings ahead of next month’s TCR UK event at Brands Hatch on June 2/3 with the Championship leader still looking for further backing to secure his spot on the grid.